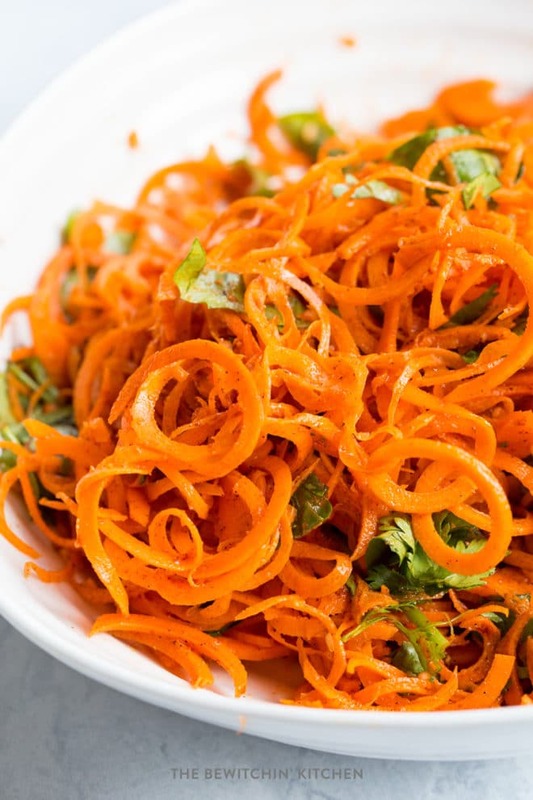 This Moroccan carrot salad recipe is a healthy side dish that uses the fun vegetable spiralizer, marinated carrots, and fragrant spices. It’s a fresh salad that uses a zesty vinaigrette (no mayonnaise) as it’s dressing! It’s a cleanse recipe I tried years ago that has stayed in my recipe box. Let me tell you, it’s a keeper. Disclosure: This post contains affiliate links for your convenience. As an Amazon Associate I earn from qualifying purchases. A few weeks ago I wrote a post about the 3 Day Refresh, a cleanse I did to help jump start my system. 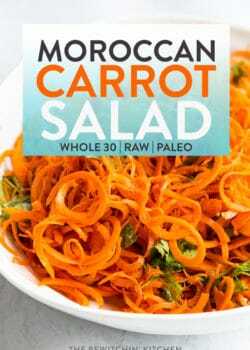 Not only did it help me crush my sugar cravings but it brought new recipes to my attention, like this tasty Moroccan carrot salad. You can grab the 3 Day Refresh here. This marinated carrot salad recipe is quick and easy to put together and has an incredible taste! 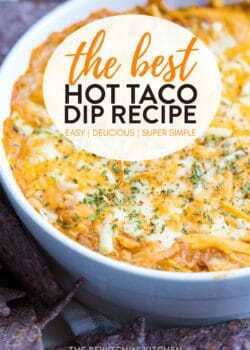 Easy and tasty? I’m sold. My favorite feature (can a salad have features? 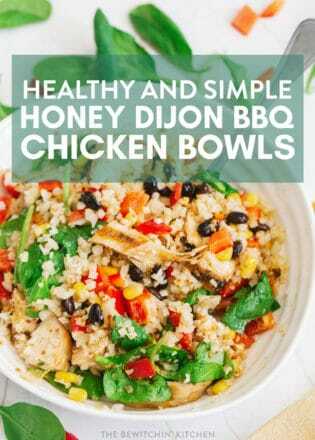 ): I like how it’s something that can be made ahead of time and doesn’t require any cooking (perfect for the coming summer heat). 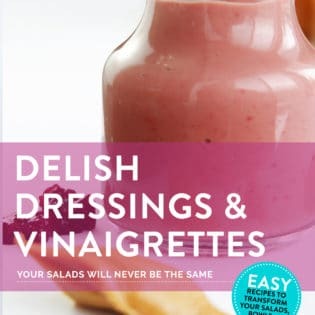 The zesty dressing is heavenly. Cumin is my favorite spice, so when I saw the recipe for carrot salad in the 3 Day Refresh book, I knew I had to try it. I was a little apprehensive about the cinnamon (I don’t like my meals to be sweet) but it really compliments the meal. Okay, now I have a whole new recipe planned in my brain. Isn’t it funny how inspiration just shows up at the most inopportune times? 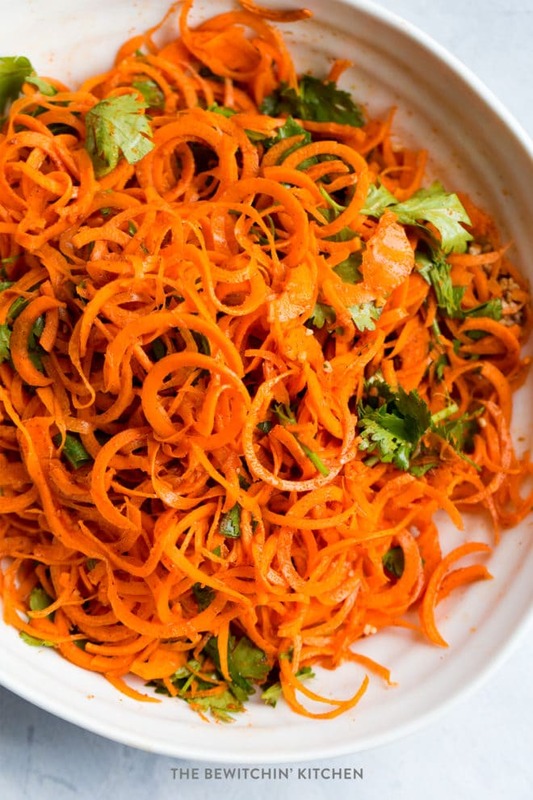 I used a spiralizer to make raw carrot noodles (or coodles, as they’re apparently called) to make this dish “fun”. Randa’s Tip: No spiralizer? No problem. You can use shredded carrot or chopped carrot for this salad. 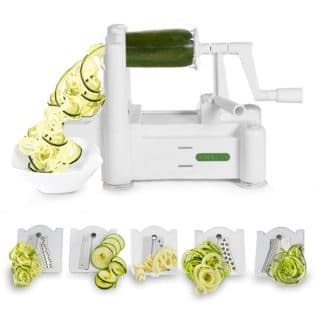 What spiralizer is the best?
. My favorite is the crank handle style. I found it easier to cut the carrots in half before I used the spiralizer. I used the small plate (since that made “noodles” for my narrow carrots vs little half moons the bigger plate made) and pushed the handle forward while cranking the handle and voila – spiralized carrots! It took me a while to realize that I had to push it forward to have it work efficiently. 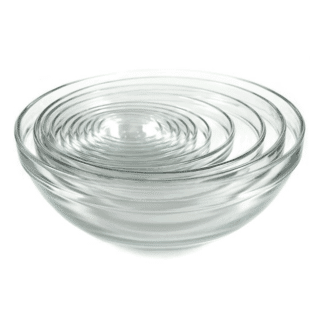 You’ll be able to use a little force since the suction cups at the bottom keep the spiralizer from moving. Do you have to peel carrots? As long as you scrub the carrots well when you wash them, you don’t have to peel the carrots. That being said, I do peel them. This is the best carrot salad recipe and it’s perfect for the coming summer months. In our home, we spend so much time with the main course, that I can forget to plan out a side dish. Since this is simple and easy, it’s one of those last minute barbecue recipes that works out every time. 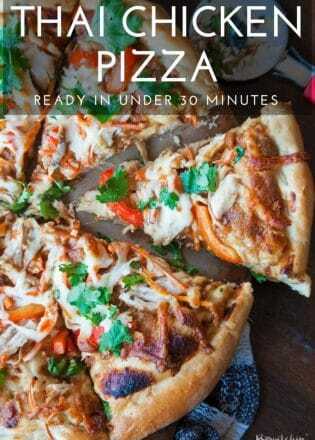 I have made this a few times now as a side dish to dish, a lunch with shredded chicken mixed in, and even as a healthy snack to help me get over the dreaded afternoon hump. Randa’s Tip: Make ahead of time and let the carrots marinate. Recipe note: If you like a spicier salad, you can add a more cayenne. What’s your favorite summer salad recipe? 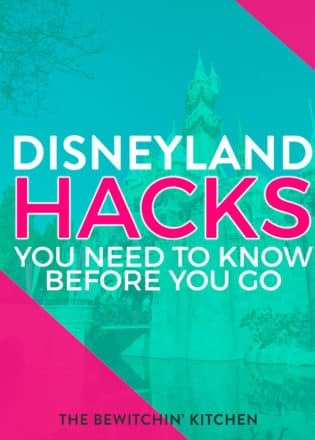 Leave me a comment and let me know (and leave me a link so I can check it out). 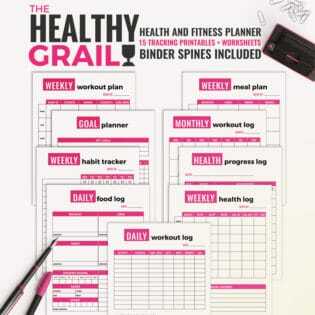 Looking for more delicious and healthy recipes? Follow me on Pinterest. 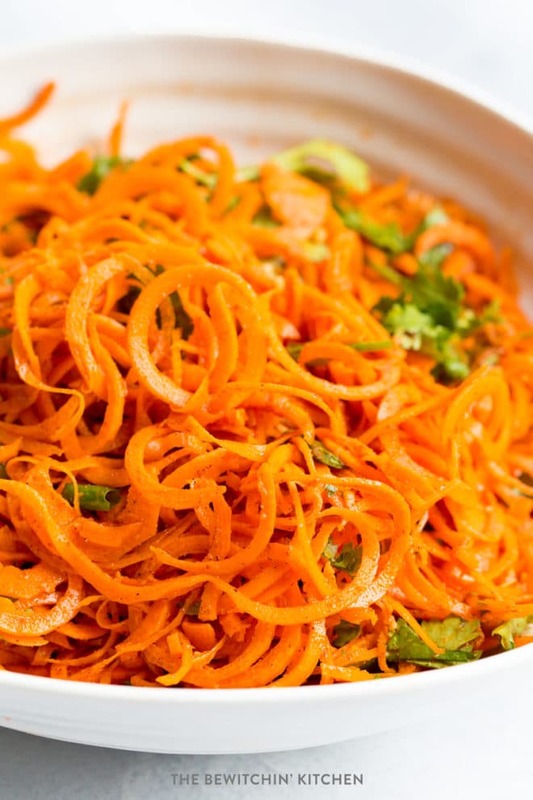 This Moroccan carrot salad recipe is a healthy side dish that uses the spiralized carrots and fragrant spices. It's a fresh salad that uses a zesty, cumin based vinaigrette (no mayo) as it's dressing! Combine all of your ingredients in a bowl and mix well. This salad is best if you let it sit and marinate (covered) in the fridge for about 2-3 hours before serving. Serve with your favorite summer main course. This looks like the perfect recipe to bring to a summer backyard BBQ or potluck. You lured me with your Facebook post! 😉 This is such a unique salad recipe! I printed it off, to save for summer BBQ’s! What a fabulous twist on carrots! The moroccan flavours make this dish unique. I am sure we would love it too! That looks so good!! 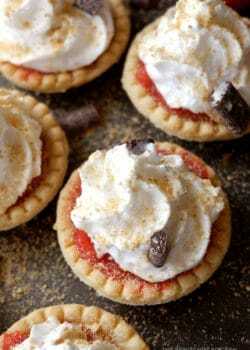 I love add Cinnamon to savory dishes!! I can’t wait to try this!! The kids love carrots and might even eat it!! 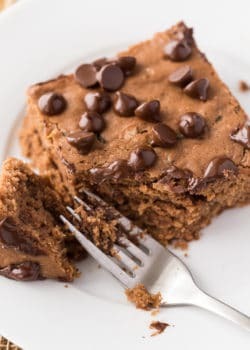 This recipe sounds delicious, & fits into my diet plan perfectly! Ooh this sounds delicious! Perfect for a light summer sidedish. Mmh, that sounds different and good. I love cinnamon. 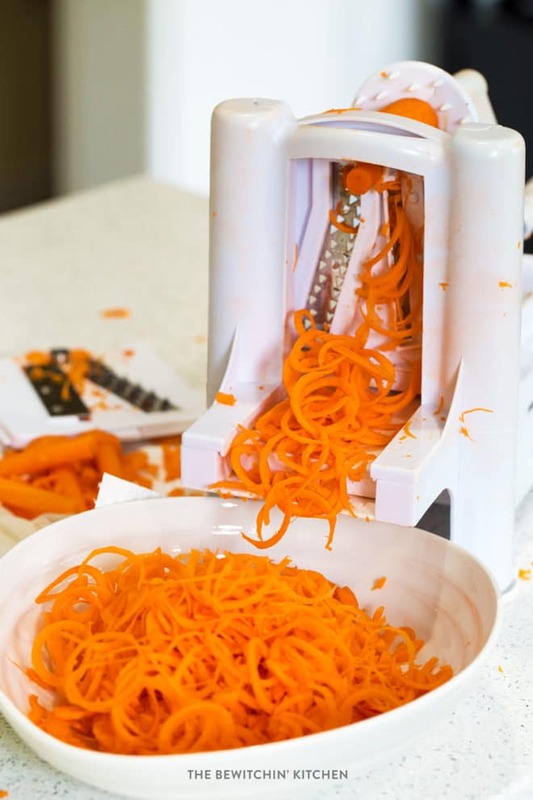 I just got a spiralizer and I’m dying to know how to use it for carrots. My first attempt wasn’t so great… Do you have any tips? 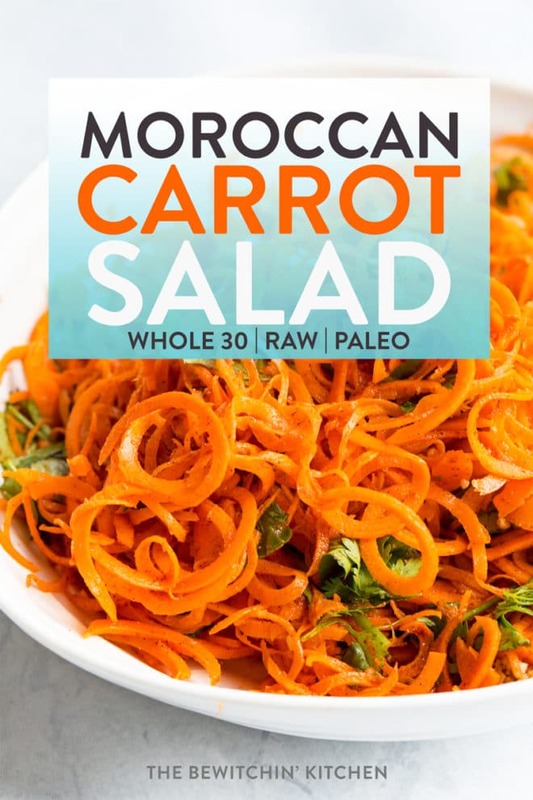 I love Moroccan flavors, this carrot salad sounds amazing! Pinning to make soon! Thanks for sharing at What’d You Do This Weekend? I hope you will join us again this Monday! Thanks for coming by Joy! It’s a great summer dish! 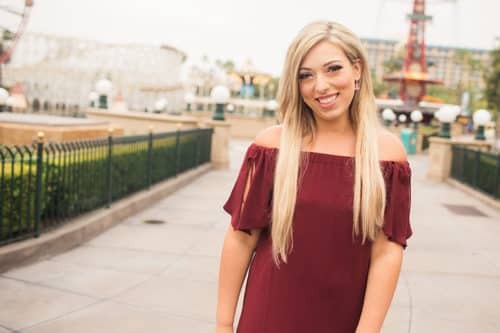 Hi Randa, stopping back to let you know that this post is one of my features this week at What’d You Do This Weekend? I hope you will join us again, the party is open now! 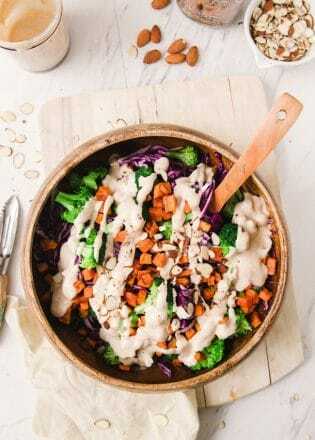 Love all the flavor in this carrot salad, i have been looking for different ways to use my carrots latley, last week i steamed some and added a garlic butter sauce on them, they turned out pretty good too.